Born to French-German parents, she studied at Paris Conservatory with Marielle Nordmann, and gained the Artist Diploma from Indiana University/USA with Susann McDonald and legendary pianist György Sebök whom she calls both decisive for her musical development. In addition, she holds degrees in musicology and philosophy from Freiburg University, and studied historical performance practice with Robert Hill, harpsichordist. Today, she is called „one of the finest artists in her field“, appearing in concerts throughout the world. She has done pioneering work being the first harp harpist chosen to represent Germany at the European Broadcast Competition “Eurovision” of all instruments in Brussels, as well as in the “Debüt im DeutschlandRadio” Berlin, her worldwide live broadcasted debut at the Berlin Philharmonic Hall with the Deutsche Symphonie-Orchester and Elias Parish Alvars’ Concerto op. 98.She also founded the Elias Parish Alvars Festival in the home town of the virtuoso, in Teignmouth/England, which is today an annually held festival with a youth competition. In 2010, she was appointed artistic director of the prestigious Swiss festival “les muséiques” an annual world class chamber music festival founded by Gidon Kremer. Bastille Paris, the Tower 101 Taipei or the Teatro da Paz/Belem, the Musikhalle Hamburg, to name a few; as well as to the Glinka Hall/St. Petersburg, to Hongkong, Shanghai, the Muséiques Festival Basel/CH on invitation of Gidon Kremer, to Hobart/Tasmania, to the Niedersächsische Musiktage, or recently the Festival “Tons Voisins” in Toulouse/France. In June 2009, she was invited to conduct the Konzerthausorchester Berlin for the first time and has been taking conducting lessons with Jorma Panula. 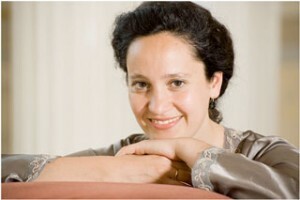 The concert season 2012 brings her to Stuttgart, to Bangkok, Freiburg, Israel and Basel, as a concert artist as well as a jury member of international competitions. Florence Sitruk won more than seven national and international prizes (Paris, Brussels, Indiana University), among which 1st prize in the Rome International Competition Valentino Bucchi for Music of the 20th century. It is especially the music of the 20th and 21st century which is strongly supported in her repertoire and to which she is a dedicated and intelligent advocate through exquisite programming. At the same time she is at the head of the revival of virtuoso Elias Parish Alvars (1808-1849), the so-called Liszt of the harp, and has performed his concertos, often as national premieres, throughout the world. A passionate pedagogue, Florence Sitruk is professor of harp at the Haute Ecole de Musique of Geneva, being long the youngest professor worldwide in her field. It is a position she also holds at the Lithuanian Music Academy Vilnius/Lithuania since the age of 26. Her talent class set up one third of the international young top players at the Xth World Harp Congress 2008 in Amsterdam; she enjoys a large international harp class. In 2015, Florence Sitruk will be the President of the Jury of the 3rd Bangkok International Harp Competition, organized by HRH Princess Sunida. The committee of Vancouver World Congress voted to have the 2020 World Harp Congress situated in Berlin with Florence Sitruk as Artistic director. Florence sitruk is a young mother of twin boys and lives with her family in Berlin.